Is Ube Filipino America's Breakout Food? I remember it being served for fiestas, birthdays, holidays and other celebrations at my hometown in the Philippines. It was cooked over a fire pit outside my grandparent’s backyard. It easily swirled around in a huge silver saucepan until it got thicker, and then men and women took turns laboring over it until cooked. After it was cooled down, it was distributed in oval-shaped containers, topped off with latik, brown coconut milk curds. The containers were served along with other desserts on the table. It stood out because of it being purple. And it only needed three ingredients: condensed milk, margarine and ube (oo-beh). It’s the ube that gave the color as well as the name—Ube Halaya or Halayang Ube, which translate to purple yam jam. But there we were eating it like any other dessert. This is how I associate ube with my childhood in the Philippines, and the process of making ube halaya was slightly different in our Midwestern kitchen. Sans the fire pit, we used already grated frozen ube product that were imported instead of fresh ube. Ube halaya was a constant food throughout my life in two different continents as it was incorporated in many Filipino desserts and snacks, including ice cream, cake, sapin-sapin, ube ensymada, halo-halo and ube hopia to name several. So, what exactly is this three-letter word that I talk with such tasty memories? In English, ube is Dioscorea alata or “purple yam,” a root vegetable with tubers and is dark purple inside. It’s indigenous to parts of Asia, specifically in the Philippines. With ube halaya, the fresh root is peeled, boiled and mashed, and can be used as a topping like in halo-halo, a filling as seen in ube hopia and ube ensymada or a flavor as seen in ice cream and cake. Ube is not to be confused by Okinawan sweet potato or taro, which either are also color purple or could turn purple if cooked. Okinawan sweet potato, which is popular in Hawaii and Japan, has a vibrant purple color and can be cooked however you like. Taro, on the other hand, is a root vegetable like ube but from the family Araceaa. It’s colored white inside but may turn into a light purple hue if steamed. Taro also can be poisonous if eaten raw. Both ube and taro are homegrown in the Philippines. While ube is used for sweet treats, taro (gabi in Tagalog) is used in main Filipino dishes like Laing or Sinigang. Out of the three, taro is the most familiar to the general public, especially for any boba-loving drinkers. But ube is on the come up as its riding the wave of the Filipino cuisine hype. A Yahoo article listed ube as one of the 16 food trends that we will be seeing a lot in 2016, and it’ll be thanks to the Filipino food establishments using ube in their menus. On the west coast, there are Hood Famous Bakeshop and Cafe86. Hood Famous Bakeshop, an online bakeshop in Seattle, garnered buzz for its ube cheesecake after it debuted in October 2013 as an item on Food & Sh*t’s pop-up menu. Cafe86, a tea and coffee place in California, stuffs their cinnamon roll with ube. Meanwhile in the East Coast, there’s ube waffles at Maharlika as well as ube donuts and bread pudding in Manila Social Club. It’s the latter restaurant that has pushed ube to the forefront. “Right now, I’m really enjoying the fact that people are saying, “Oh, well as far as Filipino food, there’s adobo, lumpia, kare-kare and oh, those crazy ube donuts,” said Manila Social Club’s Chef Björn DelaCruz, whose restaurant has been open almost a year—a baby among the growing clusters of Filipino restaurants in New York. 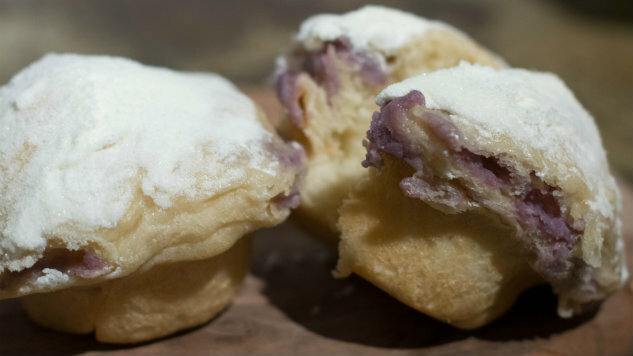 The Williamsburg restaurant began offering the ube donuts when DelaCruz made them as snack for his employees. Now called Ube Bae Donuts, customers could order them online for $40 a dozen—freshly made and picked up on Fridays only. DelaCruz makes his Ube Bae Donuts with frozen grated purple yam but also has managed to find a location in New Jersey that sells fresh ube whenever they can. While DelaCruz feels silly to say that ube is enjoying a spotlight outside the Philippines because of his Ube Bae Donuts, he can’t deny the numerous articles written about them mainly because he also serves the donuts in 24-karat gold, priced at $100. It all started when he made a black donut for the owners of Bushwick’s Brazen Brewery. The donut was iced with their White IPA beer and topped with gold dust. “After the popularity of that, the donut became something really about celebration—a celebratory kind of thing,” said DelaCruz. And after trying to figure out how to celebrate the New Year’s with his staff, DelaCruz turned to Cristal champagne and his famous Ube Bae Donuts. The idea of dipping them in 24-K gold came when they simply wanted them to look “shiny”. Because of restaurants like Manila Social Club, Filipinos are seeing their beloved ube made into beyond what they grew up eating. DelaCruz doesn’t see this as modern take on ube but as a progression of the root vegetable. And he has a point. When ube was turned into a jam and decided to be stuffed into pastries or turned into an ice cream flavor, did Filipinos then question how ube was being made? They may have, but the fact still remains that in the Filipino culinary history, ube has had its evolution, which appears to still be evolving. In the same Williamsburg neighborhood is the expresso bar Mountain Province with Ray Luna and his dad as the chefs, baking pastries familiar to Filipinos like the ube ensymada, cassava cake and bibingka. Despite the place making “traditional” Filipino pastries, there is still something endearingly fresh about Mountain Province. Situated next to a tattoo shop, Mountain Province almost seems out of place. It gives off a mom-and-pop feel that would have fit perfectly at Queen’s Woodside, where many of the “home-styled” Filipino restaurants are located. Mountain Province feels like home, and it’s was exactly what Luna wanted. Serving Filipino pastries made from the recipes of Luna’s grandmother, which he never veers from, in a hip neighborhood that lacks a Filipino community, does sound like a new concep—a dichotomy of the old and new Filipino. “We opened up this place around two and half years ago with the intention of serving Filipino pastries knowing that neighborhood isn’t Filipino and kind of introducing it to people like, ‘No, you guys, it really isn’t that weird,’” explained Luna. He still appreciates that there are chefs who are translating ube to waffles or donuts, but he also thinks there has to be someone “to hold down the forth and say this is also what ube tastes like,” referencing his ube ensymada, which is essentially a brioche stuffed with ube halaya, buttercream icing and sugar. But Luna also has presented ube in a non-traditional way. He once hosted Chef Yana Gilbuena’s Salo Project, a pop-up dinner that aims to bring Filipino food in all 50 states, and served ube halaya as a pie with a graham cracker crust and finished off with toasted sesame seeds on top. “I told my parents it has to be in some sort of vessel that people can relate too,” Luna said. Ube has the potential to become ubiquitous this year—could it be the signature food of Filipino-American cuisine? For DelaCruz, he’s enjoying that the talk surrounding Filipino cuisine isn’t focused in a singular dish, but more about what they are experiencing at a Filipino restaurant. “People are really engaging my brother, me and my sister and really wanting to talk about the food and what we’re actually doing,” he said. “And I think that’s great. It opens up a conversation of what Filipino food is.” But for now, Delacruz seems content to let ube be the focus of the conversation.